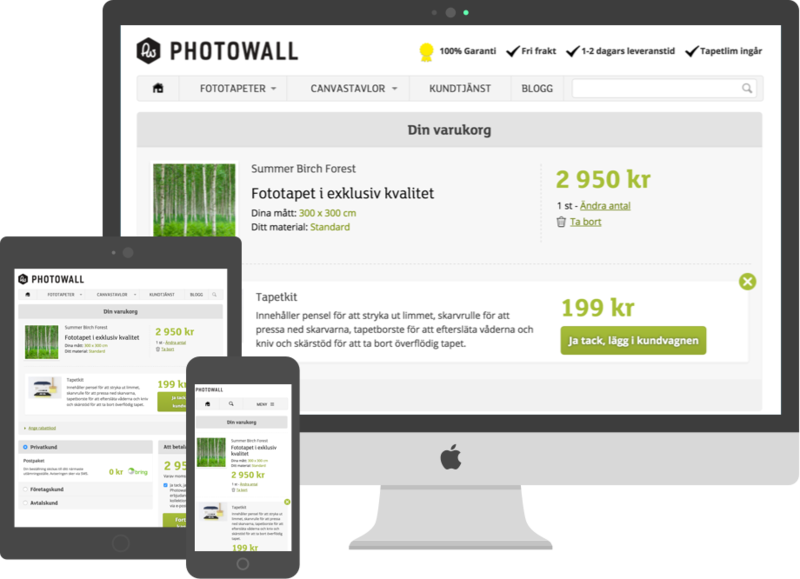 Photography Wall is the leader in image wallpaper and paintings in Sweden with a growing market abroad. In order to provide better service to customers, increase sales of additional products and to introduce clearer Checkout presented as cash solution for private customers in countries where brighten operates meddan business customers and customers outside clarified markets to easily integrate a variety of payment solution outside Klarna markets. The result was new cash with clearer product presentation and a natural upsell of tilläggsprpdukter in kundbagnen. The design makes it easy for Photo Wall to simply present a variety of payment solutions to provide the best customer service to customers in several countries. The big question was how much we could increase frösäljingen and nur easily you can make a cash flow for most countries? Photowalls customers are not always aware of what is needed to set up and install the wallpaper. Prior to working with business sales web presence created a strategic trigger map to show the users’ motivations. The calculator was geared to satisfy the needs of the audience that today like his car and trolgitvis not skullle choose to use public transportation, especially when it rains. To break through the force of habit is nödvädigt to fully realize exactly how big holes commuting to bid really delves into the private economy. The solution was so well liked that internal desire to do a calculator for private side’s needs. A further preference is to integrate with Västtrafiks travel planner and make it even enkalre to use by commuting distance is automatically calculated and displayed on the map.